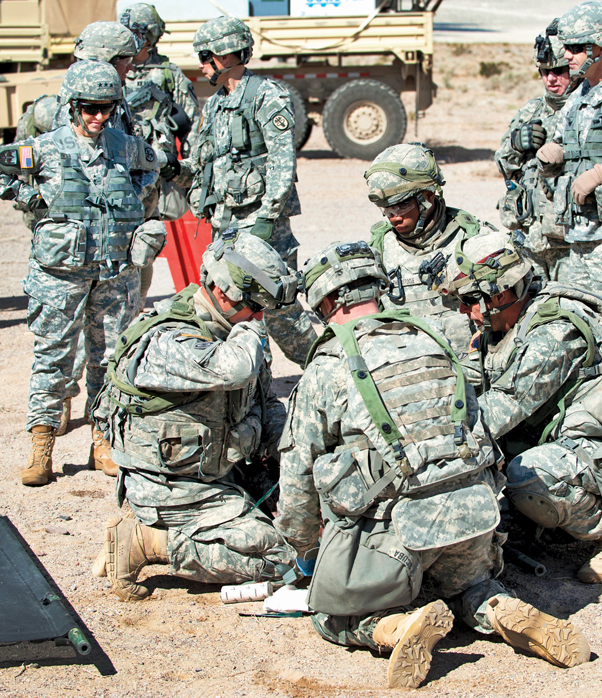 Lt. Gen. Patricia Horoho (left), Army surgeon general and commander of United States Army Medical Command, looks on as Soldiers from the 15th Brigade Support Battalion out of Fort Hood, Texas, provide treatment to the “wounded” during a mass casualty exercise here, March 2. The Unites States Army surgeon general and commanding general of U.S. Army Medical Command visited the National Training Center, March 2-3, to assess the readiness of the hospital here and get a better feel for the medical support provided Soldiers, families and retirees making up the Fort Irwin community. Lt. Gen. Patricia Horoho’s visit also provided her insight into the training medical professionals receive and the challenges facing them – not only in the training environment during rotations – but in the execution of their daily mission. 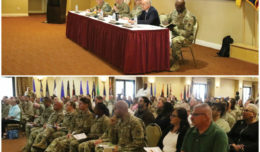 Horoho directly engaged Irwin’s medical professionals at a town hall meeting for feedback regarding the challenges they face to meet mission requirements. 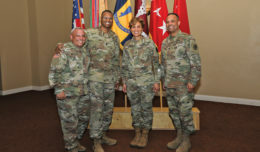 “The most unique aspect of practicing medicine at Fort Irwin is the geographic isolation with a challenging mission to provide medical support to NTC rotations,” she said. “The real challenge is balancing a difficult mission in an isolated location with the need to gain experience as the majority of primary care providers at Weed are in their first assignment out of training. The Army medicine talent management efforts need to balance both new and experienced providers being assigned to Fort Irwin based on these unique challenges to support NTC in an isolated location. “I am very excited about the new hospital construction project currently underway,” she said. 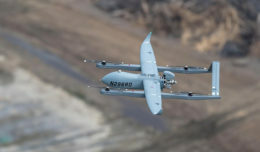 “The new hospital will be the first U.S. healthcare facility that is ‘carbon neutral’ with enough solar power to supply all the new facility power needs and even provide additional power to the Fort Irwin installation. Most importantly, the new hospital will improve the delivery of health and healthcare with state of the art capabilities in primary, specialty and surgical care, as well as inpatient and ancillary services all in support of the Soldiers, families and retirees of Fort Irwin community. “A great primary short-term goal of Weed ACH’s command team is to foster an environment in which patients and staff are treated like family,” she offered. “I often use the analogy that you don’t have to like everyone in your family, but you do have to treat them right because they are family. She said goals for the members of the team here are consistent with the mission of Army medicine – that of providing a high quality, safe and consistent patient experience.